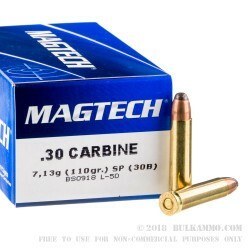 A solid choice for hunting out of your .30 carbine or for general shooting needs out of any of the productions rifles and pistols that are chambered in .30 carbine. This MagTech 110 grain softpoint load is a hot load that has sufficient energy (pending your state’s regulations) to take medium and smaller large game (like deer). 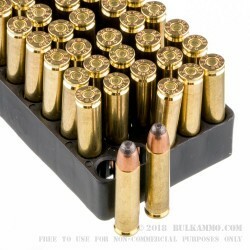 The Brass casing is Boxer primed and offers easy reloadability. The MagTech name is a proven ammunition producer with many interesting market innovations in the past. The quality generally, is quite good. The velocity for this round is just a shade under 2000 feet per second (at 1990). The energy at the muzzle is a hefty 965 ft. lbs. of energy; enough for excellent penetration at distance on larger medium sized game. 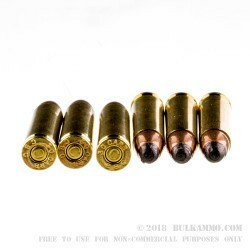 Capable of being fired out of any .30 Carbine firearm, this is a good functionality checking load, as the slightly hot powder and the soft point projectile can help to determine problems with firearms. Generally, this round is good to go in all mainstream market .30 carbine firearms. 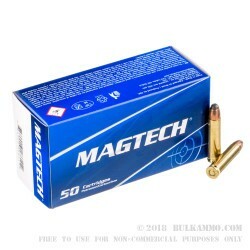 Magtech is a well-known brand and produces high quality ammunition that is in use around the world.